Andijon, Uzbekistan. Photo CC BY.20: Slava Myronov / Flickr. Some rights reserved.Kanysh-Ai is an apricot-grower in Gaz village, in Kyrgyzstan’s southern Batken province bordering Tajikistan. Like for many others living in the border areas of the Ferghana Valley, apricots are the primary source of Kanysh-Ai’s domestic income. She picks apricots when the fruit change from green to orange in color and feel slightly softened but still firm to the touch. Once the apricots are washed, dried for a couple of days, and sorted, Tajikistanis come from the district centre of Isfara city in northern Tajikistan to purchase it for its further processing. 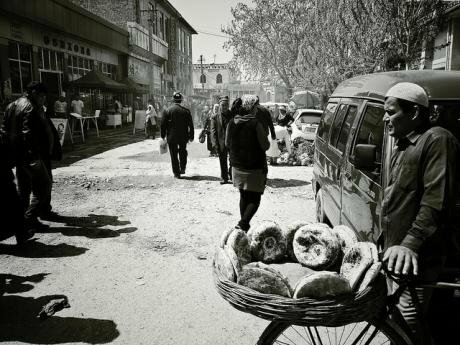 While Tajikistanis often dominate the commercial apricot market, Uzbekistanis travel to the border bazaar in Hushiar village on the Uzbek side of the Uzbek-Kyrgyz border to buy apricot pits, which they then fry and salt to sell at their local market. Located at the heart of Central Asia between Kyrgyzstan, Uzbekistan and Tajikistan, the Ferghana Valley brings together an ethnic mix from these states born out of the collapse of the Soviet Union in 1991. As the imaginary borders of Soviet times became real after independence, fragmentation has led to tension and even conflict. In the two decades between 1989 and 2009, some 20 conflicts took place in the valley. A recent academic study speaks of 164 border incidents between 2010 and 2013, while over the course of 2014 alone, the Kyrgyzstan Border Troops Information Department registered a total of 37 border incidents in the region. Various explanations have been advanced to explain conflict dynamics in the Ferghana valley, including competition over natural resources, growing nationalism in the region and the securitisation of borders. The latter has an enormous impact on daily life for many people living in the valley. Since the establishment of a new border regime, communities have experienced a constant “sense of danger” while crossing borders. As a villager from Ak-Sai on the Kyrgyzstan-Tajikistan border said, the Kyrgyz government started putting up all sorts of posts – customs posts and border posts – and all those stop people from living. In fact, cross-border interaction between community members is almost unavoidable in the Ferghana valley. Border dwellers like Kanysh-Ai, the apricot grower, find ways to continue everyday interaction at the grassroots level in response to their needs, which include trade, common use of water and joint pasture use. These interactions build trust between community members, improve relationships and forge cross-border networks. Local border communities manipulate borders as they trade for a living. Mohammed, an ethnic Kyrgyz resident of Uzbekistan, works in a small daily market in Batken town in southwestern Kyrgyzstan. He buys up to 300kg of chocolate, white sugar, sweets, pasta, oil and tea in Ferghana city bazaar in eastern Uzbekistan, which he then sells at Batken bazaar on the other side of the border. The crossing usually takes place via a chernyi vkhod, an informal parallel crossing point where goods are handed over through a house located right on the border. In the meantime, Mohammed goes through the official border crossing, giving customs officers a cigarette or two in order to maintain friendly relations, and then meets his goods on the other side. The homeowner also collects a fee, and so allegedly do customs officers and border guards. Elmira, a resident of a border village in Kyrgyzstan’s Batken province, regularly travels to the Tajikistani side to purchase cheap household goods to sell in the market on the Kyrgyzstani side. Many others like her smuggle small amounts of produce and goods across the border, while avoiding the customs regime which Kyrgyzstan joined after entry into the Customs Union and then the Eurasian Economic Union with Russia, Kazakhstan, Belarus and Armenia in 2015. The same phenomenon can be observed in the Dostuk area, near Kyrgyzstan’s southern city of Osh on the border with Uzbekistan, where men on bicycles smuggle salt from Uzbekistan into Kyrgyzstan while women take aluminium into the country. Water distribution is another important area of informal cross-border cooperation. Located in the administrative district of the city of Isfana in southern Kyrgyzstan’s Batken province, the village of Myrza-Patcha is not included into the hydrographic zone administered by the city Water User Association. Instead, it relies on water from the Isfana River, which divides and unites communities on the Kyrgyz-Tajik border, as it is also a major source of water for people living in the Navruz neighborhood of neighboring Korgoncho village in Tajikistan. In the event of a mudslide, residents of both communities organise cross-border ashar, or collective labour, to clean the river-bed. The village residents also cooperate on joint pasture use. As villagers in Tajikistan do not have pastures attached to their territory, they graze their cattle in the pastures of Myrza-Patcha. Informal arrangements are made between border dwellers, heads of pasture committees, and even between heads of villages. It is not entirely clear who on the Kyrgyzstani side creates grazing opportunities for Tajikistani shepherds and receives payment for this, but these informal arrangements are often discussed in the mosque located in Myrza-Patcha, which is attended by individuals from both countries. As one resident on the Kyrgyzstani side said, elders from Navruz come to us asking for permission for their cows to graze with ours. Beneath this grassroots-level cooperation – be it over water and irrigation, pastures, trade or apricot production – lies a desire to address common everyday needs, such as access to water, goods, and services across the borders. This enables border dwellers to get on with their daily lives despite government-level securitisation. Often, cooperation is a function of interdependent needs, as people living along the borders use the same water sources, share infrastructure, or mutually benefit from joint use of pastures. This daily need-based day-to-day interactions at and across borders help to build cross-border networks and trust between community members, often facilitating and sustaining peace on the ground. Nick Megoran, “For Ethnography in Political Geography: Experiencing and Re-imagining Ferghana Valley Boundary Closures,” Political Geography 25 (2006): 622-640. Madeleine Reeves, Border Work: Spatial Lives of the State in Rural Central Asia (New York: Cornell University, 2014). Elizabeth Dusik and Mayya Nurmamedova, “Inter-State Cooperation and Joint Planning and Management of Transboundary River Basins–The Example of the Isfara River Basin,” GFZ German Research Centre for Geosciences Policy Brief 02/2015.